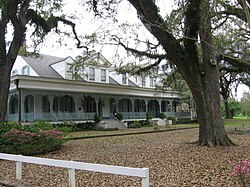 Built in 1796 by General David Bradford, the Myrtles Plantation was known as Laurel Grove at the time. For several years, the general lived there alone until he was pardoned for his role in the Whiskey Rebellion in 1799 when President George Washington ordered that Bradford be executed. The rest of his family was living in their Pennsylvania home at the time. He later moved his wife, Elizabeth, and five children to the Myrtles Plantation. The general died in 1808. Clark Woodruff, who was one of Bradford’s law students, later married Sara Mathilda in 1817, who was Bradford’s daughter. The two took care of the plantation for Elizabeth. Later on, they had three children, who were named Cornelia Gale, James, and Mary Octavia. Clark Woodruff and Mary Octavia moved to Covington, Louisiana after the death of Elizabeth Bradford in 1830. They left behind a caretaker for the plantation. Four years later, Woodruff sold the plantation, land, and its slaves to Ruffin Gray Stirling. Woodruff passed away in New Orleans in 1851. Stirling and wife Mary Catherine Cobb began to remodel the house, nearly doubling its size. They also renamed it “The Myrtles”. They had nine children, five of which died young. Stirling himself died in 1854, leaving the plantation to his wife. In 1865, Mary Cobb hired William Drew Winter to help her manage the plantation as a lawyer/agent. Winter eventually Mary’s daughter, Sarah Stirling. They had six children, and one of them, Kate Winter, died of typhoid at the age of three. Even though the Winters were forced to sell the plantation in 1868, they bought it back in 1870. A year after buying the house back, a man (suspected of being E. S. Webber) shot William Winter on the front porch of the Myrtles and died within minutes. Sarah remained at the plantation with her mother and siblings until she died in 1878. The plantation was passed on to Stephen, one of Mary’s sons, two years later when she died in 1880. Being heavily in debt, Stephen sold it to Oran D. Brooks in 1886. Brooks sold it in 1889, and the house changed its owners many times until being purchased by Harrison Milton Williams in 1891. In the 20th century, the land was owned by several people. A few of the owners noticed odd happenings at the Myrtles. The place is known as “one of America’s most haunted homes”, as it is home to at least twelve spirits. It is claimed that a total of ten murders occurred in there, but historical records only suggest the one that William Winter was victim of. In 2002, a segment of Unsolved Mysteries featured the supposedly haunted plantation. While filming the segment, the crew had technical difficulties. The Myrtles Plantation was featured in an episode of Most Terrifying Places in America. Have a personal experience here? Tell us about it! Have more information about this haunt? Send it to us here! Have an image you want to submit? Let us know!